Get 100% Cashback* up to Rs 200 on one ticket per movie. Valid only on Captain Marvel & Avengers: Endgame. Valid only on tickets bookings across all cinemas on Paytm Platform. We've got a special something for the Marvel Fan in you! 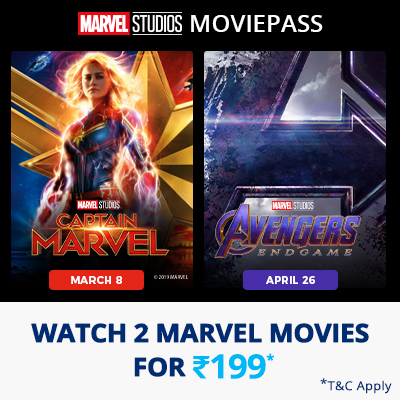 Introducing 'Paytm Marvel Movie Pass'. Now, treat the Marvel fan in you with an offering that is absolutely irresistible. Let's put an end to your curiosity and tell you how it works. Buy a pass and use it to book tickets for up to 2 Marvel produced movies in six months. Enjoy a hassle-free experience and get 100% Cashback upto Rs.200 on every booking. * Paytm Marvel Movie Pass for 1 person' entitles the user for 2 movies within 180 days after the purchase date. * Use your unique code to get 100% Cashback upto Rs 200 on the ticket price of one movie ticket. * If you book 1 ticket worth Rs 100, you will get 100 cashback. * If you book 1 ticket worth Rs 250, you will get 200 cashback. *If you book 2 tickets worth Rs 150 each, you will get total 150 cashback. * If you book 2 tickets worth Rs 300 each, you will get total 200 cashback. *Paytm Marvel Movie Movie Pass for 1 person' holder is entitled to watch a maximum of one movie a day and 2 movies within 180 days after the purchase date. * This offer is applicable on cinema in PAN India available on Paytm. *The Movie pass is only applicable on Captain Marvel and 'Avengers: Endgame'. * The Paytm Movie Pass is Non-transferable and is to be used by the registered Paytm account holder. * Promo code received is valid till July 2019. *One user will be able to use one pass at a time only. * Upon cancellation of tickets purchased using movie pass, the pass usage against cancelled tickets will not get reset and remain counted as used. * Cashback to be credited only if KYC is done. * Click on ''Your orders'' or Check Email/SMS for your Marvel Movie Pass code. * Select your preferred seat, if applicable.